Isle of Wight gardeners are invited to celebrate their work and take part in this year’s Wight in Bloom competition launched this month (8th May) in the The Chelsea Garden at the Earl Mountbatten Hospice, Newport, Isle of Wight. 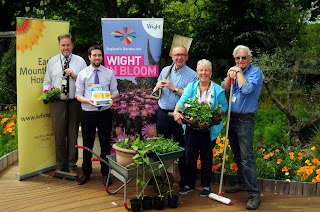 Wight in Bloom is an annual community-based competition that celebrates the Island’s diverse range of gardens - from the small space to the large tourist attraction. Sponsored by Red Funnel and organised by Visit Isle of Wight, the competition encourages gardeners to create colourful floral displays that will make the Island a brighter place to live and visit. This year there will be 11 categories including: Best Small Front Garden, Best Large Front Garden, Best Commercial Garden, Best Senior Citizen Complex, Best Young People Initiative, Best Community Floral Project, Best Small Tourist Attraction Garden, Best Large Tourist Attraction Garden, Best Creative Use of a Small Space, Best Edible Garden and New for 2017 Best Water Feature. Gardens can be entered into the competition from 19th May until the closing date of 30th June. Judging will take place from 3rd to 30th July when a team of local horticultural experts will visit the gardens to decide the first, second, highly commended and overall winner of The Peggy Jarman Trophy. Wight in Bloom are supporting the Earl Mountbatten Hospice by purchasing EMH sunflower seed packets to give to entrants of this year’s Wight in Bloom competition. It is hoped that these will be grown across the Island during the summer to support the EMH 35th Anniversary and to brighten up gardens and open spaces. 'Wight in Bloom is hugely important; it remind us all that a great deal of the Island is on constant show, and we need to look our best all the time. 'There are many green-fingered experts living on the Isle of Wight, from TV celebrities to groups of eager school children, all of whom help to make the Island look terrific. Entry forms with full details of the categories can be found at the Visitor Centre, The Guildhall, Newport, the Red Funnel website, Visit Isle of Wight website, the IW County Press Shop and all main Island garden centres. Wight in Bloom Patron Alan Titchmarsh MBE VMH DL will present the Awards at a garden party ceremony in September. Wight in Bloom has over the past two years worked with schools to encourage participation into the competition. It has recently developed an initiative to deliver a pilot mentor scheme for new School Garden Coordinators. Working in collaboration with the RHS Campaign for School Gardening project, Wight in Bloom will assist a team of experienced school garden coordinators and local horticultural experts to provide support to enable less experienced schools to set up a garden project. For further information on how to join the scheme please contact the Wight in Bloom Co-coordinator at bloom@visitwight.org. 'The RHS Campaign for School Gardening inspires and supports schools to provide children with gardening opportunities to enhance their skills and boost their development. 'The direct benefits of gardening for children are wide ranging. Registration to the Campaign is free and you can join by logging on to https://schoolgardening.rhs.org.uk/register'. 'We are delighted to continue our sponsorship of the ever popular Wight in Bloom. 'The annual competition is a great opportunity for first-time and seasoned gardeners to showcase their skills with categories designed to encourage young people and community groups to take part'.